The Hoover Levee system was erected after two storms killed thousands of people in the ’20’s–when only a tiny fraction of the current population lived in south Florida. 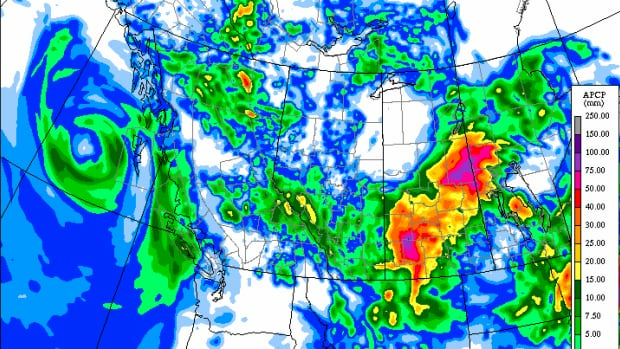 If that system collapses in another super storm, what would the death toll be with the current extremely high density down there now? As far back as our records go, Alaska has never had a 3-year heatwave like this. Ah, South Florida; another canary. Dear John McK. I haven’t spotted a canary in quite some time. Could they all be extinct? Gov. Rick Scott has or had a standing order that none in his administration could use the term “climate change”. It was a pathetic thing to watch in practice. I wonder if that numbskull is starting to second guess that command, if indeed it is still standing. Honestly, we could not have worse leadership. Seconded. I don’t think you can call it leadership if you’re unable to recognize a problem like climate change. We matter more than dollars and cents. And externalizing harm is basically a plan to drive everything off a cliff. The economic theory Scott’s ideology is based on is pure nonsense. His coffers are filled by the sugar cane industry. That is why he rescinded his predecessors efforts to buy farmland to provide more area to filter / allow the water to clean up. He is a bought man who does their bidding. Thus farm run off will not change. I used to think of Money as the Universal Lubricant or Universal Solvent, but, in fact, it is the Universal Pollutant. Great post, Robert. A perfect example of how climate change affects everything. Thanks Ryan. This particular event appears to have caused a good deal of confusion. Lots of people putting the Army Corps of Engineers into a no-win situation. This is just what happens when the lake’s flood protections start to be overwhelmed and when unsustainable farming practices meet with increased run-off due to heavier downpours in a warmer world. And, yeah, it’s pretty much all connected. We’re in the midst of serious global heat. We just set the record for warmest 12 month period nine months in a row. “2014 and 2015 each set the record for hottest calendar year since we began measuring surface temperatures over 150 years ago, and 2016 is almost certain to break the record once again. It will be without precedent: the first time that we’ve seen three consecutive record-breaking hot years. – Koch Industries formerly Koch Nitrogen — as N plus phosphorus = algae feeding fertilizer whether in a ‘spill’ or everyday runoff. As Wili pointed out above The Hoover Levee system, is very old, and like all infrastructure in this country, in need of much repair. 1. The levee is expected to fail. I know that sounds bad, and it is. FEMA is apparently planning to update flood assessments this summer and redraw flood maps for Palm Beach and Martin counties. These flood maps are expected to be drawn as if the levee around Lake Okeechobee didn’t exist. In other words, they are not counting on the levees to protect against flooding. used as a reservoir and therefore the dyke is now operating as a dam. That is a tremendous distinction. A dyke that is intended for floods is not exposed to constant pressure and erosion. When I think of a flood control dyke / channel I think of “Duffs Ditch” aka the Red River Floodway, not a bloody standing pool of water. We built this problem. There was a time when overflow from Lake O simply seeped south across the Everglades. This mostly seasonal flow of water floated on top of the salt water below and maintained a fresh, high quality, aquifer that supplied population centers in South Florida. The other side of the discharge to the sea is that there is less fresh water for the Everglades ecosystem, AND less water AND lower quality water for South Florida population centers. A recent town hall in Ottawa met with some opposition from Tom Harris of the Ottawa-based International Climate Science Coalition which does not believe that climate change is human-caused. Harris’ group accuses the govt of turning the town hall process into “pep rallies” and of “loading up the events with propaganda.” Harris wrote up his complaint for The Toronto Sun. Here is the Canadian govt’s portal on climate change. There is quite a bit of info here, for a range of audiences, including the presentation that Tom Harris found so one-sided and hence objectionable. In Jean Marie River, N.W.T., community members are worried about their country food. Scientists and hunters say diet is threatened by thawing permafrost, which is gradually turning lichen-rich forested and shrubbed areas — where caribou come to feed — into wetlands, even lakes and ponds. And last year, scientist warned of a potential flash flood due to thawing permafrost. Steve Kokejl, a permafrost scientist with the N.W.T. government, warned of a potentially “catastrophic lake drainage” at a remote lake just south of the treeline, about 20 kilometres away from Fort McPherson, where thawing permafrost was encroaching on the banks of a small lake. The Trudeau regime is ideologically identical to the Harper infestation, but with a smiling front-man, rather like the Obama long con. Don’t expect anything useful from laffing boy, Justin. Right again, MM. As many of us knew from before the start, JT is but a poser, and a pawn of the powers that drive energy and economic policy in Canada. His sole purpose is to look cute and talk nice, and thus to take our minds off the continuing corporate takeover of this country. One of my favorite questions to ask students on exams is about the Great Lakes region as a climate winner. Something like, you are a mayor in a midsize city on Lake Michigan. Over the last three decades your town has established itself as the poster child of the Rust Belt. After watching a scientist talk about climate change, you decide your city should be a climate winner. You have water, lots of water. And, well, you have never heard anyone complain about how hot it is in the winter or, really, the summer. How can you use climate change to rebuild your city? As my reader will know, I have become a bit focused on our commitment to several feet of sea-level rise. Flying into Chicago earlier this year, seeing the city on the clear, ice-free lake, well, it will not be too long until we are talking about moving the U.S. capital. Or will we build the Potomac barrier? The Patuxent Barrier? The Patapsco Barrier? 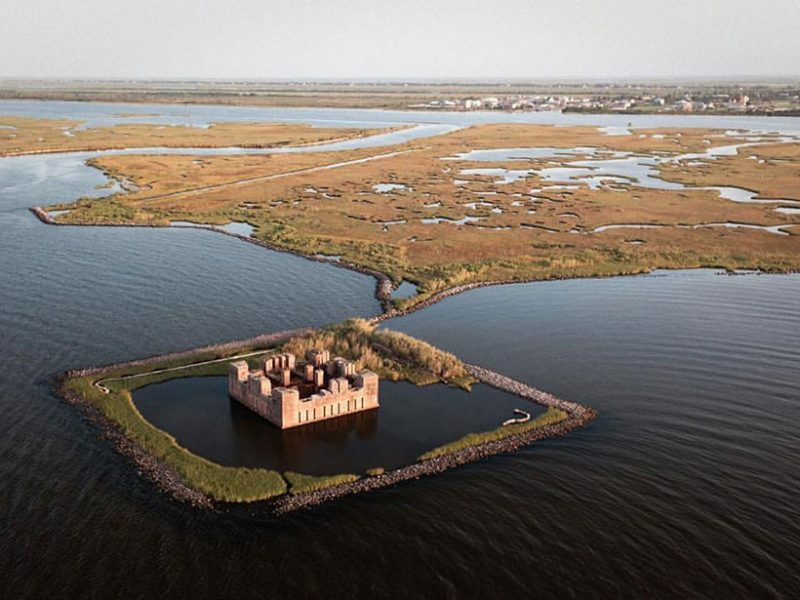 The Piscataway Barrier? The Pohick Barrier? What about the Point No Point Barrier? Nice, but there aren’t going to be any winners, unfortunately. Climate change could have a domino effect on key infrastructure in the UK, government advisers have warned. In a 2,000-page report, the Climate Change Committee says flooding will destroy bridges – wrecking electricity, gas and IT connections carried on them. The projections are based on the supposition that governments keep promises made at the Paris climate conference to cut emissions – a pledge that is in doubt. The committee says if emissions are allowed to spiral, London summer temperatures could hit 48C (118F) in an extreme scenario, although the advisers say they don’t expect that to happen. On the left A Sea of Grass. On the right A Latrine. I recently visited Denali, the highest mountain peak in North America and my favorite place on the planet, for the first time in 13 years. Prior to working full time as a war reporter, I lived in Alaska for nearly a decade, where my life revolved around spending my summers mountaineering in the Alaska Range. Another long-time Denali mountaineering ranger told me of a phenomenon on Mt. Crosson, a mountain nearby Denali, where rock and soil that are becoming increasingly exposed by melting glacier are blowing onto the ice — which is accelerating the melting, as the rock and soil warm and melt more ice. – I found the following comment to Dahr’s piece interesting — as the early 1970s was when I personally felt the climate change around me but had no vocabulary to quantify it. To me, an over riding issue is crop failure, either by outright non production or non-edibility due to toxicity. Dahr at least mentioned those concepts. In the fall 2014 issue of California Monthly, Stacy Finz reported that deciduous tree crop yields and quality of yield have been decreasing since the 1970s in yield and quality of yield per tree; and that the some crops in parts of California have experienced total failure due to too warm winters for vital winter processes to occur. An example given was the failure of the cherry crop in parts of California due to too warm a winter. Cherries are a non-vital crop to the welfare of society but not so for wheat. The link Dahr gives lists wheat as a vital crop that in parts of the world has been un-edible due to aflatoxins. Collapse of civilization due to crop failure is not going to be sudden. Crop failures have always been with us but are increasing so that they affect larger and larger areas, making it harder to move vital foods around to meet the needs of people in areas where crops have failed. When are failures of essential crops going to become large enough to get the attention of Americans? When food shortages start hitting our dinner tables and our favourite eateries. When foods we North Americans take for granted start to disappear. When the range and variety of foods we see in supermarkets dwindle. When meat prices start rocketing out of reach. When unreliability of supply becomes the norm. When food becomes dangerous—toxic, contaminated, etc. When hunger becomes a reality for people in your neighbourhood. That’s when, and only when, the majority of people on this continent are going to look around and wonder what’s up. Good points, Cate. But of course, hunger is already a reality for many people in many neighborhoods throughout the US. I volunteer at a soup kitchen (though we prefer the term ‘community meal’ and it is busy every day, and getting busier. wili, yes of course. To our shame both in the US and Canada, hunger is a reality for many in North America. But to too many people, it is still invisible, confined to certain areas—inner cities and so on. When it becomes visible everywhere, that’s when people *may* wake up to the reality of climate change. wili, I would add as well that community food banks, for example, have been well-established in my own area for decades, but have been used mostly low income earners. However, as the oil bust bites hard, we are now seeing more middle-income users. The fact remains that no food bank use so far has had to figure in the effects of crop failures and consequent shortages and disappearances of foods that climate extremes will bring. We need to electrify everything that currently runs on FF or we are doomed for sure. Airplanes are critical for this as RS recently scribbled. An update, thanks to Peter Sinclair and a recent interview with Fully Charged about the subject. In addition to the obvious with regards to pollution, and noise, some advantages to an electric aircraft include that they aren’t prone to cold shock which can crack ICE engines when changing altitude, they don’t require oxygen so you can go to higher altitudes, they get more power per kilogram and don’t need to adjust mixture controls when changing altitude. The technology is evolving rapidly in the small plane category. Really, a lot of what we have to ‘do’ is to STOP doing idiotic pointless things that gobble up vast quantities of stuff fossil-death-fuels that we really shouldn’t be using any of for pretty much any reason. But yes, for the few really critical purposes for air travel, these are a good idea. I’ve always thought lighter-than-air would be the way to go for future energy savings. Probably hot air, tho I saw recently that a large reservoir of helium has been found in Africa. Plenty of lift for batteries, and all they have to do is run a few smaller props. You might even cover the topside with PV to keep the batteries charged. wili, absolutely agreed that most air travel is now non-essential and yes, frivolous—the hallmark of a lifestyle of over-consumption and self-indulgence. It’s not just about going from FF to electric air, it’s also about the expectations we have around travelling, and what will be the effects of more and more people demanding the “right”—-which is really a privilege—-to travel when, where, and how they like all over the planet. But even in these ‘dark times’, there was one bank that many coal miners could still count on for financing and advice: Deutsche Bank. Deutsche Bank is also, co-incidentally or not, bust. 4.13 ppm this is getting alarming! Well,Shawn. I would certainly love to believe this as an El Nino hangover. 41.3ppm/decade, anyone? Kevin, and more, if that annual rate of rise in ppm is increasing. This is unthinkable. To add to DT’s comment up thread about the web of denial being exposed in the senate. – The denier/liars have been at it a long time too. That’s why denialism exists, will NEVER go away and, if anything, is increasing in Anglosphere dystopias. The value of fossil fuel ‘assets’ on the books of mega-corporations, including the banks, insurance and other financial corporations is in the tens of trillions. That ‘asset wealth’ under-pins the entire omnicidal edifice of end-stage Free Market fundamentalist capitalism. Reduce the value of that to zero, as we need to do by NOT extracting and combusting it, and capitalism collapses. The Bosses will GLADLY kill off 99% of humanity to protect their wealth and power, and take their chances on surviving the ecological collapse. It’s sad to admit, but you’re right, Mulga. The value of known fossil fuel reserves is so high that we will always see a well funded and pervasive attempt to dismiss climate change and also insist we need fossil fuels in order to support our economy and provide prosperity, or some other BS like that. Ryan and MM, sadly agreed as well, esp the comment about the Bosses taking their chances on survival: lcorporatists are essentially psychopaths and so consider themselves invincible in the first place, and in the second place, they believe that money will fulfill all their wildest dreams—this is why we see them experimenting with space travel, which has nothing to do with “tourism” and everything to do with their last-ditch escape plan in the event of planetary catastrophe. The plan is to retreat to the Arctic, while the rest of humanity dies off, and cruise around the area “akin to the Mediterranean Sea” , I think. The oil tankers will be converted to water tankers, and deliver water to the thirsty hordes in Southeast Asia and Africa – it says so in Foreign Affairs, so it must be true. That their “Mediterranean Sea” could become a hydrogen sulfide producing cesspool covered with purple bacteria with methane geysers shooting up out of it from dissociating methane hydrates doesn’t seem to have occurred to them. Or, maybe they have that figured out, too – will the polar oceans be the last to become anoxic? I think myself that this article is as close to a view into the minds of the Rockefeller clique as we’re going to get. It comes from Scott Borgerson, a visiting fellow at the CFR think tank – and David Rockefeller gifted the CFR with at least 25 million dollars during it’s recent fund raising drive. David Rockefeller is a former chairman of the CFR, and remains its Chariman Emeritus. Borgerson testified before Congress, was interviewed by fellow CFR member Dan Rather on CBS, published a series of op ed articles in major newspapers, and participated in round table discussions about the Arctic with Senator John Kerry, who subsequently started echoing many of Borgerson’s talking points. Americans might not read Foreign Affairs, but foreign governments certainly do. So, is this a real plan to profit from the destruction of most of the earth’s biosphere? I think we have to assume it is. “The coming Arctic boom will involve more than just mining and drilling. The region’s Boreal forests of spruces, pines, and firs account for eight percent of the earth’s total wood reserves, and its waters already produce ten percent of the world’s total fishing catch. Converted tankers may someday ship clean water from Alaskan glaciers to southern Asia and Africa. This ExxonMobil / Rockefeller clique seems to deal in selective propaganda aimed at different groups. For the ignorant, there is simple denial, produced by the ExxonMobil web of deceit. For the greedy, here we have the promise of Arctic riches, produced by the Rockefeller supported Council on Foreign Relations. Those are some downright disturbing views, Leland. And a great example of how the elite view this world. The majestic and awe-inspiring forests of the North are simply “wood reserves”, as if it’s dead already and worthless until chopped up and sold in the global market. When will we realize that these people are stealing our future and literally killing the biosphere? When future generations have nothing left, struggle for basic survival and tell stories about what the Earth used to be like…thick forests full of magical animals that took tens of millions of years to evolve, oceans full of life and vibrant with color and splendor, stable weather that was predictable and reliable for growing crops, and Winter, oh how Winter used to be so wonderful. The investigative reporter Greg Palast believes that our elites generally have a published plan for the actions they support. Publishing it, generally in a limited access forum, provides deniability if someone starts to publicize and react negatively to the contents of the plan. The claim can then be made that the plan is just the author’s opinion, and nothing more. So publishing the plan is a way of hiding it in plain sight. I think that this series of articles by Scott Borgerson of the Council on Foreign Relations think tank is the actual Rockefeller / ExxonMobil clique plan for the greening and exploitation of the Arctic. Only they forgot to include the methane hydrates and a methane catastrophe in the plan. I agree with you that the conceptual and semantic frames of the Borgerson articles are the most disturbing aspects of them. Of course resources are meant to be exploited, the articles assume. Of course the Arctic will simply heat up, and become a new Mediterranean sea – complex ecological effects like ocean acidification, eutrophication, and anoxia are simply left out. Of course the rest of humanity should be left to suffer and die, while a small group of people profit from the economic exploitation of the Arctic. Of course the genesis of the warming is unimportant – who cares that the Rockefeller / ExxonMobil clique profited from creating the global warming in the first place? Of course the Arctic profits are the most important aspect of this problem – with no mention of the gigantic costs to the conventional economy of global warming itself and adaptation to it. Of course the warming will not get out of hand and a low level runaway greenhouse effect and methane catastrophe will not ensue – this clique employs experts to tell them what they want to hear, and then this clique believes what the experts say. The conceptual and semantic frames of the article, and of the entire output of the Council on Foreign Relations, are really deeply disturbing and repugnant to many of us. Crushed another record yesterday , old record was 104F. New record is 15F degrees above average, overnight lows running 12F degrees above average. After a record day of 108 degrees more heat headed for the South Plains. I expect highs to stay at or above 100 degrees through Friday of this week. Here’s the numbers for the week, Tuesday 105, Wednesday 104, Thursday 101 and 100 degrees to end the week of summer heat. The blinking lights on a 300-meter tower where scientists have measured emissions from oil, gas and agricultural operations in Erie for nearly four decades are going dark by the end of the month as researchers are reluctantly decommissioning the facility. Robert Webb, director of the Physical Science Division at the National Oceanic and Atmospheric Administration Earth System Research Laboratory, notified scientists of the looming loss in a letter dated June 14. The tower in question, known as the Boulder Atmospheric Observatory, is actually situated just northeast of Erie High School, north of Erie Parkway and between Weld County Roads 5 and 7. The 100-acre parcel of land on which it’s located is owned by the Colorado State Land Board, and has been leased to NOAA for many years. – Yes, the Daily Camera. Many visits there years ago as I had relatives working there. Was a Knight-Ridder (honest media) paper. ‘Development’ is how the cancer cell describes its life’s work. – Historical note: It was brutal slavery that begat this sugar industry. Shifting cloud patterns bear the hallmarks of a warming world, and will likely contribute to global warming going forward. An analysis of satellite data between 1983 and 2009 reveals that cloud tops are reaching higher into the atmosphere and that cloudy storm tracks are shifting toward Earth’s poles, confirming the predictions of climate change models. Both these trends suggest that clouds will be exacerbating – rather than mitigating – climate change. #1 More, and larger hail storms. Bob, Also greater incidence of lightning due to greater charge separation as the cloud height increases. Also, greater incidence of lightning arising from increased charge separation with increased height of clouds…. Thanks, Abel A. This reminds me of Lovelock’s thought that the best thermometer on Earth is sea level. Stephen Schneider added, also the height of the tropopause. In early May 2016, an algae bloom grew to cover 85 square kilometers (33 square miles) of Florida’s Lake Okeechobee. The conditions that gave rise to the bloom have persisted into July, and have been blamed for affecting water quality downstream all the way to the Atlantic Ocean. 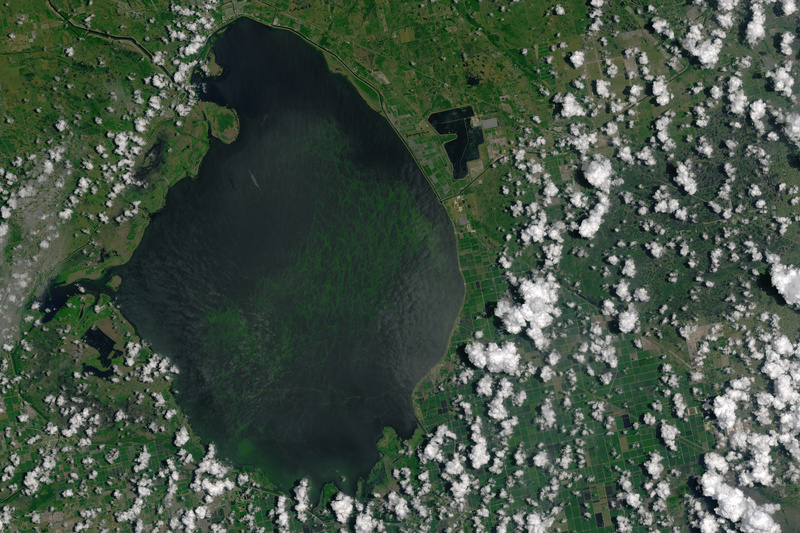 The blue-green algae bloom is visible in this image of Lake Okeechobee, acquired on July 2, 2016, by the Operational Land Imager (OLI) on the Landsat 8 satellite. The natural-color image combines red light, green light, and coastal aerosol (blue) light (bands 4, 3 and 1). Blue-green algae, also known as cyanobacteria, are single-celled organisms that rely on photosynthesis to turn sunlight into food. The bacteria grow swiftly when nutrients like phosphorus and nitrogen are abundant in still water. The bloom pictured here may contain blue-green algae, as well as other types of phytoplankton; only a surface sample can confirm the exact composition of a bloom. Over 40 years ago, I used to live just Northwest of this fire in Salida, Colorado. There are seven, 14,000 ft. mountains around the town . Besides the fire’s smoke plume, one other thing jumps out , there is zero snow pack on any of the mountains in this shot. The fire is burning at the Northern end of the Sangre de Cristo Mountains, one can see the Great Sand Dunes to the South, and Mount Blanca below it. Another huge 14,000 footer. To see zero snow on any of these peaks at this time of year is very troubling, very troubling. – Nice description of the area, Bob. – ‘ Zero snow pack’ — how true. B15 was calved over 16 years ago. Greg, Good catch there. This is great news not only in showing that offshore wind can now compete on purely economic terms with fossil fuels, but also because Shell are now moving seriously into renewables. A long time ago (15 years?) oil companies seemed to moving in this direction (BP even flirting with renaming itself “Beyond Petroleum”), but then got cold feet for some reason. Let’s hope they’ve finally realised it’s the only viable way forward. Last month was the warmest June in 122 years of U.S. recordkeeping, beating out June 1933, according to the monthly climate roundup released on Wednesday by NOAA’s National Centers for Environmental Information (NCEI). Each of the 48 contiguous states came in above its average temperature for June, with Arizona and Utah setting all-time June records for heat. Thirteen other states had a top-ten-warmest June, stretching across the nation from California to Florida. “(I find this study quite disturbing)” As you should. It is one more of a large number of mostly exacerbating (“positive”) feedbacks, of which I have a list that takes up 250 pages. This could be a relatively big one, though. Another thing about this one, it backs up the model’s predictions, to a large degree. It is good to see this spelled out, to help make sense of what I am seeing. As a painter, I watch the sky a lot. Skies have definitely changed out here in Newfoundland. In the summer now, skies alternate between clear blue and thick turbulent overcasts. Our weather has become less changeable, in many ways—-we get long stretches of this cloudless blue, then a stationary low pressure system parks over us, bringing howling winds and deluges of rain. The sky on clear days can become smeared-looking, almost milky-metallic, with what looks like high diffuse cirrus. The summer afternoon clouds of my childhood—blue skies full of those little puffy fair-weather cumulus clouds, are a rarity now. A side-effect of all this cloudless blue weather is relentless, blistering, unshaded heat: whenever the sun shines—even as early as May—the mercury shoots up to 28C as a matter of course. It makes a good letter to the editor/decision-maker. One denialist lie was that clouds would prove a negative feed-back, and I don’t expect this study, or any others, to stop them using it. Their followers are nothing if not ignorant, paranoid, morons. Same thing here in Eastern Townships of Quebec – rarely see that clear “sky-blue” sky. Usually “milky” looking. The ‘milky look’ as I understand it is the result of the 7% or so increase in atmospheric water vapor that is a direct result of (and also a major fast feedback to) Global Warming. The western boundary currents, which run along the eastern coasts of South Africa, Asia, Australasia, and South America, carry massive amounts of heat from the tropics northward…They have been getting stronger and warmer since CO2 in the atmosphere has been increasing. Good article, though talk of a “northward” movement of heat is incorrect. They should have written “poleward” instead, since they are referring to both hemispheres. Someone should back a dump truck load of coal fly ash up to the RNC headquarters, and hit the dump lever. And when they get arrested for spreading hazardous waste , they can site the RCN platform in their defense. The March of the Morons. Save us from such idiots! Two papers , one on clouds and one on currents both saying that respective subjects are moving to the poles. Pretty amazing . Each one carrying more energy than in the recent past . – There’s probably a fair amount of atmospheric and wind ‘confusion’ at the equator as well. – The atmosphere now has to accommodate a lot of moisture (solid) vs air (gas). “respective subjects are moving to the poles.” amen. We might have to join ’em or begin living below ground. Robert..and to all here….I as a 50 year resident of S. Florida and want to thank you for writing this blog to shed light on a problem those of us here have had to deal with for decades. I must say as much as I appreciate it…it is also difficult and frustrating because so little has been done…due to many factors…the biggest being “Big Sugar” and the politicians owned by them. There are days…when it is hard to get out of bed….knowing nothing is going to get done in our state because of the Climate Change “denial-ism” that is rampant (starting at the top) among our state legislature. But we keep on trying…..
Just two weeks ago hundreds showed up on the beach and made a “human sign”…in 90 degree plus heat that spelled out… BUY THE LAND……..
..as an attempt to force our politicians…to finally take the actions necessary to “start” the process of healing our polluted waters. I just hope and pray that “this time” ….things might change. Researchers from Italy and Switzerland have developed a new climate change model that predicts up to 30% more precipitation during peak summer storms nationwide. The model, developed by an international research team that includes Christoph Schär of the Swiss federal technology institute ETH Zurich, can simulate precipitation events at a resolution of two kilometres (1.2 miles), which is more precise than previous global models. It shows that by the end of the century, rainfall during peak events of summer precipitation would increase by up to 30% – which translates to an increase of about 6% per degree of warming. You’re right under the jet traffic to Europe . May be for Cate – but as noted above in comment – we don’t see those clear blue skies anymore in Eastern Townships of Quebec – and we are not a major flight path area. Have been 65 years in the same area, much time out of doors and observing – and changes are evident. Getting in a good crop of hay has become much more uncertain than just 20 years ago. How did it come to this???? AFRICANS ARRIVE IN VIRGINIA, 1619. One stormy day in August of 1619 a Dutch manof-war with about 20 Africans on board entered port at the English colony of Jamestown, Virginia. Little is known of these newly arrived people: the first Africans to set foot on the North American continent. Then read about the murder of Emmit Till in 1955 , after they beat him to death they wired a gin fan around his neck and dumped his body in the river, his crime ? Smiling at white woman. After thousands of murders, Lynchings, and fire bombings this 14 year old boy;s death changed America. The modern world we find ourselves in today begins with Emmit Till. Africa slaves were sold naked. I think that there is some evidence of commerce in pre-Columbian times, between West Africa and the Americas. – I don’t remember a link to this June 26 piece. Very interesting number crunching/gaming here. The scenario for the ‘Food Chain Reaction’ simulation was created by experts brought in from the State Department, the World Bank, and agribusiness giant Cargill, along with independent specialists. CNA Corp’s Institute for Public Research, which ran the simulation, primarily provides scientific research services for the Department of Homeland Security and the Federal Emergency Management Agency. – Agribusiness giant Cargill is a huge entity. ‘By 2024, the scenario saw global food prices spike by as much as 395 percent due to prolonged crop failures in key food basket regions, driven largely by climate change, oil price spikes, and confused responses from the international community. Dave W, agreed, except that it’s not easy to grow veggies when the weather is so strange and extreme. In Newfoundland everything is late this year, despite days of 30C weather in May—we’ve also had so much cool, wet, windy weather. We had frost warnings two nights in a row last week, which is almost unheard of for my area in July. And as the climate worsens, growing backyard food will become even more challenging. It´s French Guiana… considered a part of France, like Alaska and Hawaií are a part of the USA. Since France is also purple, probably one of the 20 biggest shipping companies is French, and so the purple dot in South America. – USA – West Coast — Wildfire SE of Sacramento, CA. 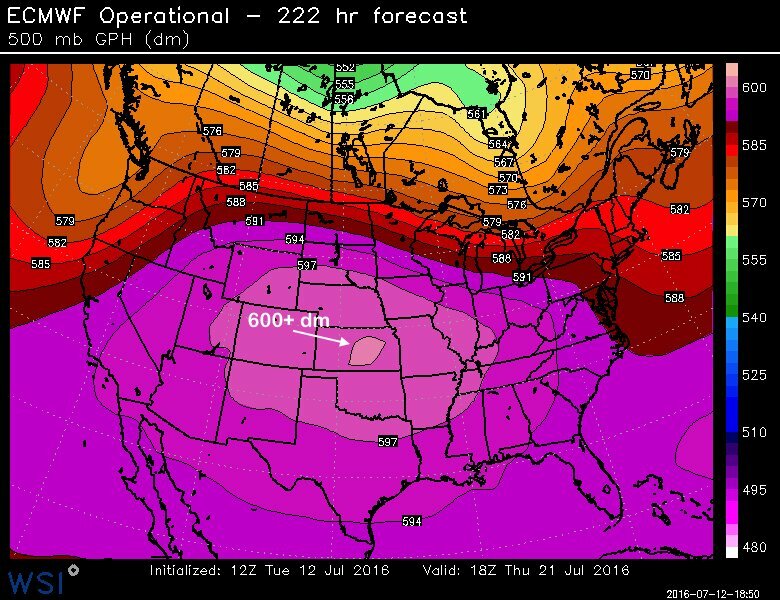 For grins…when a 600dm 500mb ridge is possible, weather geeks take notice. Expansive “dog days” #heat next week. Here we are all . Some one stand up , I’m an old dead man. And Sanders just conceded…pretty much the last remote chance to really stand up against the corporate interests driving the country and the planet into perdition. Here’s A4Real’s long blog post on the massive increase in thunderstorm and lightning activity over the Arctic from 1915 to 2016. What has happened with activity during the last two years has no parallel in the lightning database. We are seeing effects due to sea ice melt that are enabling storms to generate cloud to ground strikes over 600 miles into the ice pack… or what used to be ice…. More info about the recent lightning activity. Thanks, dt. I find those tiny micro-climates (wrt time of tstorms) around SF in that map rather odd and interesting! A4Real has a new thread over at ASIF, Iced Lightning. Neven indicated he’s going to post about it on his blog soon. Which I think means we should be keeping an eye on this. Thanks,willi et.al. A4R,dt… I found myself on a sailboat 150 nautical miles east of Nantucket in July 1990. Dead batteries. No LORAN or running lights. Sea sick owners and crew. Stifling heat and not a puff of air sunup to sundown. (No electronics, no Yanmar diesel auxiliary power…) For three nights in a row, everything changed. The towering Monsters came upon us. Fierce downdrafts. Wild wind shifts. Heavy fog, 12′ steep short seas, blinding rain. And lightning I did not believe possible. I shared this with my USCG brother after I brought the craft & crew back to Newport,RI safety. He was a veteran of meteorological ocean stations off southern Greenland. He graduated the US Coast Guard class for weather at Governors Island, NYC. He told me lightning almost never occurs offshore. All that earthquake activity from CSG and Fracking will be producing fracture lines, creating new areas of thinning and resultant geothermal activity. Earthquake Capital may yet wear the crown of the US’s newest active volcano in a rich carboniferous zone. – I came across this oil & gas threat map. A good reference that is frequently updated. Honda Co-Developed a New Hybrid Car Battery in Order to Avoid Procuring Rare Earth Metals From China. To overcome the barrier of relying on these rare earth elements, Honda teamed up with Daido Steel, a company with a unique approach to making neodymium magnets. It uses a process called “hot deformation,” which creates nanometer-scale crystals. The nanometer crystal structure is much smaller than the crystal structure formed through the more common method of manufacturing, according to Honda. The nanostructure allows for magnets to achieve higher heat resistance without requiring heavy rare-earth metals. Concentrating Solar Power (CSP) is making big strides, and China is set to install 10,000 megawatts in the next five years, which should bring the costs down. This form of solar power addresses the problems of intermittency that PV solar experiences. Meanwhile, experts warn that we’ll only see more of these dangerous blue-green algae blooms as global temperatures rise—in Florida and nationwide. With Sanders now out of the way, the Democratic establishment can go merrily back to their incrementalism, as Cornel West put it. No need to bother with vision or bold leadership. Let’s go back to (futile) efforts to compromise with the no-compromise Republicans. Although I don’t expect Hilary to feel bound by the party platform anyway, the refusal of her delegates to back the fracking ban means, to me at least, that we will stay with a basicall BAU scenario. There may be a few minor initiatives, but nothing to seriously challenge the FF industry. Vision has been re-defined as unrealistic, and the noise I hear in my mind is the last of my naive shreds of hope for real change crashing. …Yet Obama administration officials and many energy policy wonks continue to suggest that we will need to rely on burning natural gas, nuclear energy and even outfitting coal plants with carbon capturing technologies for some time. In contrast to “keep it in the ground,” their approach has sometimes been labeled “all of the above.” Meanwhile, Clinton has called natural gas, in particular, a “bridge” to a cleaner energy future. typo…should be basic BAU scenario. Wind and solar are superior energy sources to gas and nuclear and coal now. Nuclear is high cost to build, high liability, slow build. Coal with carbon capture is far more expensive than wind and solar. Gas requires fracking which wrecks our water supplies. Using ‘bridge’ energy sources will lengthen the time of fossil fuel burning and lock in warmer and warmer temperatures. The subsidy support necessary for these sources will draw investment and other interest away from renewables at a critical period. Globally, it may be enough to get us off a BAU path, but it won’t get us off a very destructive near BAU to mid range path. Such policies assume a 3 to 4 C warming this Century — 6-8 C long term IF fossil fuel burning stops at the end of this Century and IF carbon feedbacks are moderate. The most responsible policy positions involve keeping fossil fuels in the ground and transitioning as rapidly as possible to renewable energy. At this point, they are also the most economic. The only incentive, politically, to protecting fossil fuel interests now is the defense of various monetary interests. We should be on a footing where all new energy comes from renewables — wind, solar etc — not just due to the fact that it will drastically cut carbon emissions, but also due to the fact that these resources use less water, are modular and rapidly deployable, and have far, far less overall down-chain externalities. In other words — not only are these energy sources climate change mitigators, they are climate change resilient. Highest totals 98 mm in 24 hours. High for this latitude. Large storms there last night as well. Scientists have for decades hotly debated what killed the dinosaurs. One long-held hypothesis blames immense and long-lasting volcanic eruptions that drastically altered Earth’s climate. Another more recent hypothesis suggests that the dino die-offs occurred after a massive asteroid hit the planet near the Yucatán Peninsula. Now, research finds that the extraterrestrial impact may have led to increased volcanism in the Indian subcontinent, providing a double whammy that took out Tyrannosaurus rex and his kin…..local water temperatures rose, on average, about 1.1°C (2°F) in the wake of the asteroid impact. But water temperatures jumped a whopping 7.8°C (14°F) around the same time the volcanoes, which erupted in what is now India, began spewing planet-warming carbon dioxide some 150,000 years before the impact. Cannibalism is a sign of food resource stress among hominids. The practice at first often becomes ritualized in the form of eating the deceased. In worse cases, the practice tends toward hunting and eating of one’s enemies. During some complete collapse scenarios, you end up with gangs of the strong eating the weak. If Neandertals were out-competed by Homo Sapiens, the during the period of their decline it is altogether likely that they would have experienced food resource stress. If they were less effective hunters and gatherers, the first shock would have come in the form of less resources overall, increased hunger, increased disease, increased death rates. As populations collapsed, this problem would have multiplied due to the loss of productive individuals and due to population inequality vs the likely encroaching homo sapien populations. I´m not sure if food resource stress needs to be present for ritual cannibalism to occur. Maybe to begin the tradition, but once it gets ritual, traditions can go on for a long time. The Tupi tribes in Brasil praticed ritual canibalism of captured enemies. And there was almost no food stress in Tupi society. Brasil was as fertile then as it was now, or better. There was a lot of gathering (even in a stroll in the woods now it´s easy to find lunch if one knows what´s edible… like more than 300 fruits by different trees around here), a bit of agriculture (manioc, corn, beans, planting tree seeds around), plenty of game, some of it kept captive (mallard ducks were exported to the world, but a few other species, like peccarys and guans, where also raised… they were quickly replaced by pigs and chicken in the colonization, but they´re also productive), and no signs of bad-nutrition in archeological finds. Estimates find that the “working” time used to guarantee food in tupi society was less than 3h/day (both for men, who fished and hunted and for woman, who gathered and planted). I known that caniballism is taboo, and it´s difficult to imagine that it would arise in a situation different from desperation, seeing with modern eyes. But humans can be quite different in their ways, so that something that is a complete taboo for one society can be normal for other. Right brain memetic cultures have at times ritualized cannibalistic behavior absent a food stress. But it’s typical that food stress acts as a trigger for the behavior and is likely the initial cause in cases where ritualistic cannibalism has been adopted long-term. Medicine takes an even dimmer view of humans. The article below is not the only one in this vein. John Collinge is a top prion researcher. Cannibalism and Prion Disease May Have Been Rampant in Ancient Humans. Some call it the laughing disease; others, kuru. This neurodegenerative disorder is universally fatal and 40 years ago killed almost 10% of a small New Guinea tribe called the Fore. Now molecular biologists propose that similar epidemics plagued prehistoric humans. Both then and more recently, kuru, a prion disease, was transmitted through cannibalism, Simon Mead and John Collinge of University College London and their colleagues claim in a report online in Science this week (www.sciencemag.org/cgi/content/abstract/1083320). They base their conclusions on the worldwide distribution of variants of the prion gene. The work lends support to the idea that ancient people once regularly munched on their peers. This conclusion will be controversial, says John Hardy, a geneticist at the National Institute on Aging in Bethesda, Maryland. Nonetheless, “I think [Collinge and colleagues] might be right.” . . . Need a little help with that victory garden? This might help. Grow gardens not lawns! As individuals, it’s easy to feel powerless in the face of global climate change. We can make individual choices to live with less, and cut down on our own personal carbon footprint, but how do we really make a difference? The article references the US specifically, but I don’t think we are much, if any, better in Canada. See also links to several good articles at the bottom of the Guardian page. Hat tip to Desdemona Despair. – I see the waste all the time. It’s gross and disgusting to witness, and to know it is happening. And it is quite ‘American’. Fruit falling from trees and vines, just to rot is a common sight too. The funny (tragic) thing is that even though we (the US) are the most wasteful country on Earth there are still millions of Americans among the impoverished and hungry of the world. I think the biggest waste in the U.S. is that we eat so much meat. A few years ago, we fed enough grain to meat animals in the U.S. to feed something like a billion people. That’s something we can all work on, eating less meat, I think. Chicken, turkey, fish, eggs and dairy products are all less CO2 intensive than beef, and fruits and vegetables are better still. ‘I am the river and the river is me,’ Now In New Zealand, Lands and Rivers Can Be People (Legally Speaking)…The settlement is a profound alternative to the human presumption of sovereignty over the natural world… Personhood means, among other things, that lawsuits to protect the land can be brought on behalf of the land itself, with no need to show harm to a particular human. 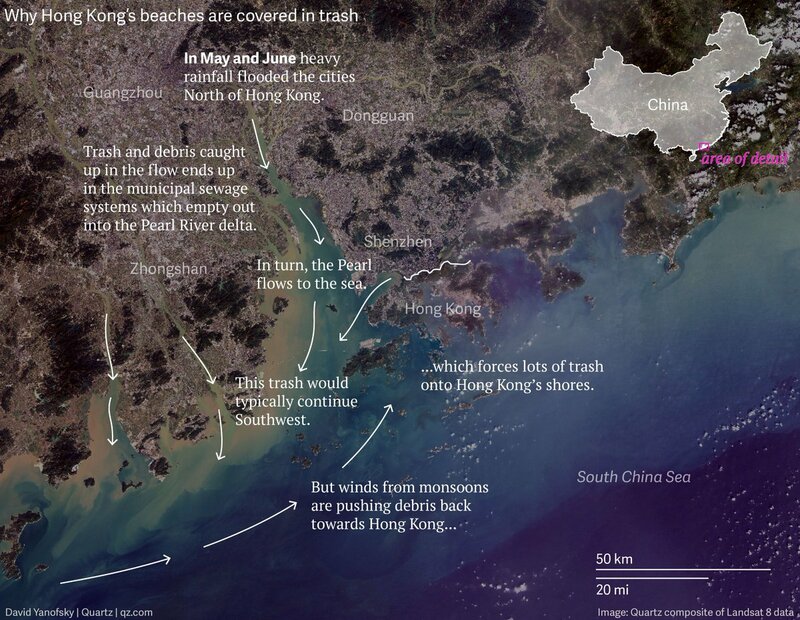 – China – Hong Kong – Chinese trash dispersed by extreme weather. ‘Local authorities have described the filth as a “glacier of trash,” and that the rubbish from one island could even be seen from space, the Epoch Times wrote. From July 1 to 9 alone, government departments collected 78,000 kilograms (about 172,000 pounds) of litter from affected areas, the South China Morning Post reported. On Sunday, chief executive Leung Chun-ying and his team of 60 officials and workers collected about 1,350 kilograms (about 3,000 pounds) of garbage in about half an hour during a beach clean-up in South Lantau. Leung blamed the influx on heavy rains and floods that struck southern China. I like how they blame storms and wind/currents for trash piling up, but not humans for creating and dumping it in the fist place. If we stopped polluting like we’re the last generation before the world explodes, we wouldn’t have to be dependent upon favorable conditions for garbage free beaches. Some of the world’s largest cities are sinking faster than the oceans are rising. Humans are part of the problem, but we can also be part of the solution through monitoring and modeling. Coastal lowlands, which rise less than 10 meters above sea level, are particularly vulnerable to the climate change effects forecast for the 21st century, including the threat of inundation by accelerating sea level rise and increases in severity and frequency of tropical storm surges. These threats coincide with a worldwide surge in human population in coastal areas. Coastal population centers include several megacities, whose populations exceed 10 million. Many of these coastal megacities are located on river deltas that are also major centers for agriculture, fisheries, and hydrocarbon production. – It’s quite a comprehensive effort here. Worth factoring in Geological processes we are just getting a grasp on this believe it or not courtesy of the oil industry and their geological surveys over decades. Sure to have the deniers jumping all over it as the reason for climate change rather than CO2 being a driver. For the first time, geologists have compiled a global map of the wave-like motions called “convective currents” inside Earth’s mantle. They found that those convective currents are moving roughly ten times faster than previously thought. The discovery can help explain everything from how Earth’s surface changes over time to the formation of fossil fuel deposits to long-term climate change. “In geological terms, the Earth’s surface bobs up and down like a yo-yo,” geologist Mark Hoggard of Cambridge University said in a statement. Hoggard is lead author on a paper published today in Nature Geoscience. Our planet’s deep interior is an enduring scientific mystery. Having never drilled more than a few kilometres beneath the surface of the Earth, geologists rely on indirect measurements and models to get a sense of what’s happening further down. The mantle is a nearly 3000km layer of gooey, compressed rock, and convective activity within it has a big impact on Earth’s surface. That’s changing, thanks to new high-resolution seismic reflection profiles created by the oil industry. Seismic reflection profiling is a technique geologists use to peer deep into Earth’s crust, by measuring the reflection and refraction of seismic waves as they travel downwards. The method can reveal fine-scale changes in the thickness of the crust, which in turn relates to mantle convection. By analysing over 2000 seismic reflection measurements taken across the world’s oceans, Hoggard and his colleagues constructed the first global database of mantle convection. They were surprised to discover frequent changes in the thickness of seafloor crust, indicating that mantle convection is occurring far more frequently than we thought — think a vigorously bubbling pot of water instead of a slow-churning soup. A new book by Laurence Delina is garnering some attention. Bill McKibben gives it a nod for demonstrating how a global WW2-type mobilisation might be put into practice to address the effects of climate change in a timely enough way. Not cheap, though. Anyone here read or reading it? Nice to see that someone is looking at this. Not cheap, but better than losing pretty much all of the natural wealth that supports us. Cheaper, in other words, than fossil fuel burning in the long term. "..some on-air forecasters…are loathe (or even forbidden) to mention it." Ps The headline is better than article. But glad to see the topic mentioned. – Weather is a matter of survival. Most weather reporters are relegated to about a minute and half of travel. traffic, convenience, and recreation related weather data and forecasts. Broadcast/weathercasts are usually followed by a car commercial or drug tonic for what is often an environmentally caused ailment. Traffic and weather reports are often treated as one. “The headline is better than article” applies to the JS WaPo article not the AGU-EOS. "Globally it may be one of the hottest months ever." A panel of climate experts organized by SEARCH, or the Study of Environmental Arctic Change, met in Washington, D.C., to draw attention to the historic melt-off of snow and ice during the first six months of 2016 — and the resulting problems. The lack of snow, a result of record-high temperatures across the planet, not only intensifies water shortages and the threat of wildfires in California and other parts of the country, but also amplifies global warming. Because snow helps reflect the sun’s hot rays, less of it means the Earth only heats up more, the scientists said. “Snow helps reflect the sun’s hot rays, less of it means the Earth only heats up more” – this is something i have alluded to in the past in regards to the re-accumulation of snow. So, say meteorologists start making attribution part of their forecasts. Do we get daily reminders for how not to screw up the planet? This approach is very tricky. If you use a severe weather hook to talk about climate change, especially when lives or property have been lost, climate deniers will brand your message insensitive or opportunistic. But without meteorologists connecting the dots, how else will people start to see the those human “fingerprints” on their weather, and potentially make changes? In a place like Alberta, which will be recovering from the Ft McMurray wildfire for a very long time, it may not be popular to make a connection to climate change, but I’d argue it’s critical. This is a region where the economy is almost entirely supported by the extraction of fossil fuels. These fossil fuels are in turn directly contributing to the warming that has extended the region’s fire season by 20 per cent in just 35 years. In this case, suppressing that connection is not just destroying the livelihoods of those residents, it’s criminal. Giving weather attribution data to residents who have lost everything in severe weather events might empower them to demand serious reform. Hold on. Lots of false premises here. The experts have known. But the general populace has been largely confused over the issue. And, absolutely, we need to tie meteorological forecasts in with climate change attribution. What would happen if we didn’t talk about potential impacts of powerful hurricanes? We wouldn’t be prepared. Same goes for climate change. It’s not just about experts knowing, it’s about information and education enabling a response from the majority of the populace. And, of course we’d have better policies on climate change if we’d talked about this issue. We’d have adopted renewables faster, we’d have cut carbon emissions faster, and there’d been none of this worry about climate change deniers — because they’d be recognized as the crackpots that they really are. Failure to talk about climate risks is absolutely vastly irresponsible. Both the European and GFS models, among others, are depicting the height of the 500 millibar pressure surface, which is normally located around 5,000 meters, or 18,000 feet, to be at or above 6,000 meters, or 19,685 feet. This is a rare event that is an indication that this event may be unusually severe. Being a long way away physically, after all that rain and flooding. 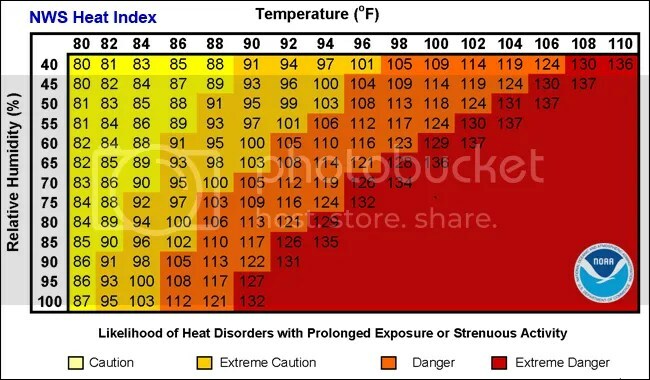 How is the wet bulb temps with all this heat . ? Good news time: this is from Newfoundland, where the economy is really hurting from the effects of the oil bust. We have a lot of unemployed oil workers here. Some have come together to form a group called Iron and Earth—not a band, but a “non-profit social enterprise committed to catalysing Canada’s renewable energy economy.” They aim to transition oil workers into green energy development. Good on them—a brilliant and forward-thinking move on the part of these young and highly-skilled workers. Iron and Earth have signed an MOU—just a first step, but it has to begin somewhere—-with a local wind energy company to develop SIX offshore wind farms in Atlantic Canada. This is very good news indeed. I often feel that this kind of movement would be catalyzed by a parallel movement to develop local renewable energy based economies. As an example, the Lions Club in the US has worked on community development projects for decades. A similar group that worked on community renewable energy development and climate change resiliency could positively enable the kind of transitional work flow that could help these oil workers move to more sustainable jobs capable of supporting their families. From a heatwave mass casualty risk standpoint, looks like the coastal western US is something to look out for. Of course, anytime you start to get power outages due to heat and the ACs start shutting down, then you’re going to have a pretty big issue. Worth noting that solar energy provides demand response at exactly the time when days are hottest. Hot nights, however, are a growing problem as well. This mainly due to the fact that higher greenhouse gas levels support higher relative night-time temperatures vs day time temperatures. Would you pay U.S. $37.50/month to have Tesla battery back-up power so you never lose power? To agree to share that power with the power company when they need it for brief periods of time? Green Mountain Power of Vermont figures its a win win for them and is offering the deal to customers in lieu of them buying back-up power for $6500 for their homes outright. So here’s an example of an energy system that could benefit from incentives/carbon tax/carbon pricing. It’s also worth noting that the cost of these battery packs will probably halve in the next 4-7 years. Interesting that we’re already seeing payback times of 17 years due to reduced costs of peaking energy supplies. We’ve gotten our names on the waiting list to house one of these batteries. Timetable still uncertain at this point. Those 8 years can be chalked up to corporate media dominance and bullying by climate change deniers spreading doubt over the issue. Note that over the past 8 years public awareness of climate change increases during national elections, then tends to fall 1-2 years after as the media cycle kicks in. No major media source at this time should be giving equal time or space to climate skeptics or climate change deniers. 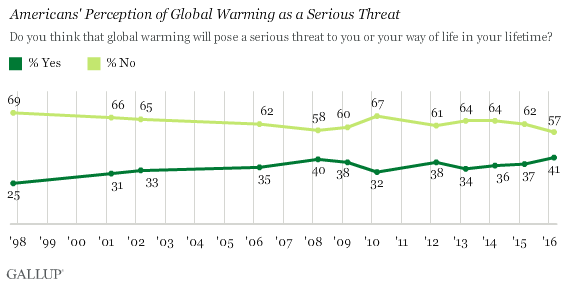 Climate change is the most serious threat we’ve ever faced as a civilization. It is the author of 4 out of 5 of the major mass extinction events and the cause of most of the smaller ones. Global wealth of life on Earth is dependent on climate. Change the climate and you get severe harmful impacts. It’s worth noting that these perceptions are 10-20 years out from global human civilization experiencing severe fracturing due to climate change and 20-40 years out from potential collapse events. The pace of events is quickening now. It’s just a question of what tempo and severity we can handle. Of course, it’s not just about human beings. It’s about the wealth and beauty and vitality of our world as a whole. Continued burning of fossil fuels guarantees the loss of the Great Barrier reef and most if not all of the corals around the world. And it’s already setting into play one a mass extinction event that could be, if we keep burning fossil fuels, worse than the great dying of the Permian. Serious threat? For life on Earth it’s worse than nuclear winter. Think of the difference in climate change impacts between now and the 90s. Now imagine the severity of current impacts worsening by a similar degree over the next 15 years. Then again in the following 12 year time-frame. That’s the BAU to near BAU path. Without serious resiliency efforts, mass migration pressure will double to triple over the 20-30 year horizon. Pace of sea level rise will probably have increased by 50 to 150 percent over that period. Crop stresses will have multiplied. We’ll almost certainly have crossed the 1.5 C threshold and may have hit or crossed the 2 C threshold if keep it in the ground campaigns are defeated by fossil fuel special interests. There will be a liveable future in that time-frame. But it’ll be a tougher one. One more subject to issues of scarcity (water, food, maybe energy if renewables aren’t rapidly developed) social and political fracturing. One that will demand far more adaptation and resiliency and cooperation than we currently achieve or plan for. If we’re still afflicted with the same levels of inequality, wealth concentration, and resource externalities that we see today, or if those factors worsen, then today’s social unrest will look like a tempest in a teapot as water, food, and access to land that’s not flooding or degraded or in a non productive new climate zone becomes a serious issue. The early outlier period for climate change will be ending and we’ll also start to see some of the initial major event impacts. – Wildfire Colorado still burning — no containment. What’s noteworthy right now isn’t at the core of the continent: it’s along the fringes, where some exceptional heat has been produced in recent days. – Habitat destruction — mostly human caused. The variety of animals and plants has fallen to dangerous levels across more than half of the world’s landmass due to humanity destroying habitats to use as farmland, scientists have estimated. This is heartbreaking. What have we done to this beautiful world? – Along with hot air temps ozone will be a problem for many in the West. So far they say “nothing is changing”, as it says at the bottom of the article – but this sure sounds like some serious deprioritisation. From a seperate “Department for Energy and Climate Change” to a combined “Department for Business, Energy and Industrial Strategy” headed by somebody who wanted to get fracking infrastructure designated “nationally important” so that local councils couldn’t block wells in their areas.